According to Webster dictionary.com these are some of the definitions for the word “Ground”. Each one is fitting for today’s post (Essentially a review of the week). I usually have some interaction with the surface of the earth everyday and to be honest, I rarely think about it – unless it’s face first or something. The ground seems to become more and more significant the further I get from it. If I’m in a plane, I think about getting safely to ground. The further I go out into the ocean, the more I feel called back to land (I’m clearly a land-lubber). However, I would be willing to bet that I could name the person who thought about the “surface of the earth” most of all yesterday. It was his worst enemy and his best friend, it could have ended him, but he couldn’t wait for it. I’d imagine that there would be a few mixed feelings speeding toward the earth at nearly 730 miles per hour. Yes, he must have been thinking all about the ground yesterday. Yes, it must have been the sweetest thing to set foot on it again, safe and sound. I wonder who felt better about having the ground under their feet again, Columbus and his men hundreds of years ago, or Felix Baumgartner yesterday? Either way, it must have felt great! Both inspiring stories of human determination and courage in the face of the unknown. I was resisting all urges to do anything at all on Sunday. However, I forced myself to go out and do something active on what was actually quite a nice day. So, I ended up taking a bike ride to the nearby Bolton Abbey and its surrounding “Grounds”. It turned out to be an excellent decision. It was about a 18 mile ride round trip along the Wharfe river, which runs through Wharfedale in Yorkshire. Not only was it a beautiful ride in and a beautiful location, I also got my lazy bum out and got some good exercise! It was also great to get out of the neighborhoods and into some good old fashioned Yorkshire countryside. By the way, bike rides are a great way to get exercise in when your body and mind are making it difficult. It’s a less harsh workout on your body than running and you feel great doing it because you make so much progress! Thanks to my cousin (1st cousin once removed if we’re going to get picky) Chris for lending me the bike. I admit I added <football ground> myself, it wasn’t in the definition, but it works all the same! This is a suitable definition for me because I’ve been going to so many football grounds. This week, I attended two more games. On Tuesday, I went to see local 6th tier team Guiseley AFC take on a Welsh side, Colwyn Bay FC (same division), in an FA Cup qualifying round replay game (The FA CUP is played by all English teams, so it’s a big chance for small teams to gain notoriety and play some bigger clubs if they do well). It was a replay because the teams tied in the first leg of the round. However, if this game ended in a tie there would be overtime and then penalties if needed. It was a good game overall and a decent level of play. Guiseley is sitting 3rd in the division and has just missed promotion the last few seasons (I’ve been trying to get into training with them). Colwyn Bay is in the lower half of the table. The first half was a well fought contest and while Guiseley probably saw more of the ball, Colwyn Bay had the better opportunities and went into the half leading 1-0. The 2nd half, however, was dominated by the home side and when they eventually scored the final outcome was inevitable. Guiseley scored a 2nd soon after and added a 3rd after a Colwyn Bay player was red-carded in a tussle off the ball. The level of play is similar to the PDL in the states, although most of the players in the Conference North would probably have more overall experience, which might give them an edge. There was a good crowd (probably around 500+) and it was a good atmosphere for a chilly Tuesday night. This is something that we are lacking considerably in US sports. Lower level teams with a decent local following. There are a few teams in the PDL who provide this kind of environment, but its few and far between. There are surely many factors that play into this, but that’s a chat for another day. 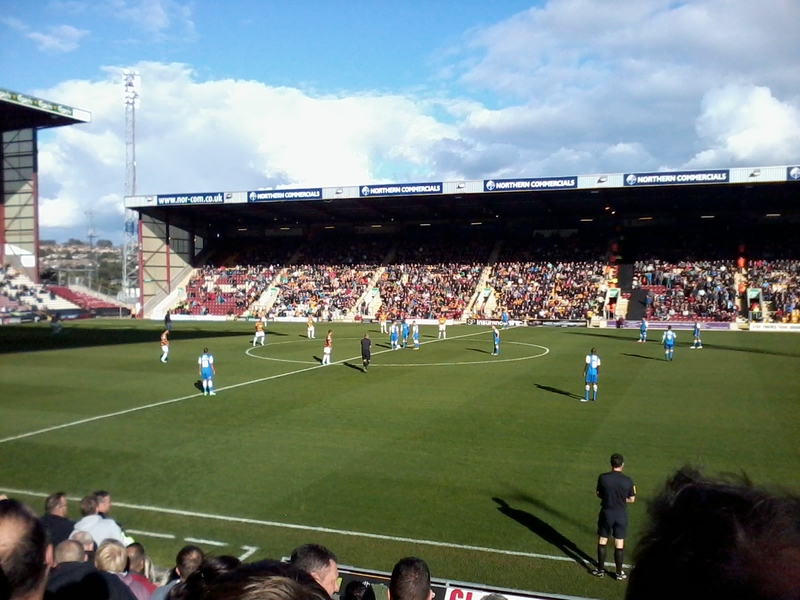 On Saturday, I went to another Bradford City game at Valley Parade (Ground). The Bradford City ground is large by league 2 standards, holding just over 25,000. This is because they were in the top tier of English Football not too long ago, before mismanagement and poor form led to a decline. Though it is rarely filled (nearly 12,000 for this game) they still draw more fans than most other teams in this league. 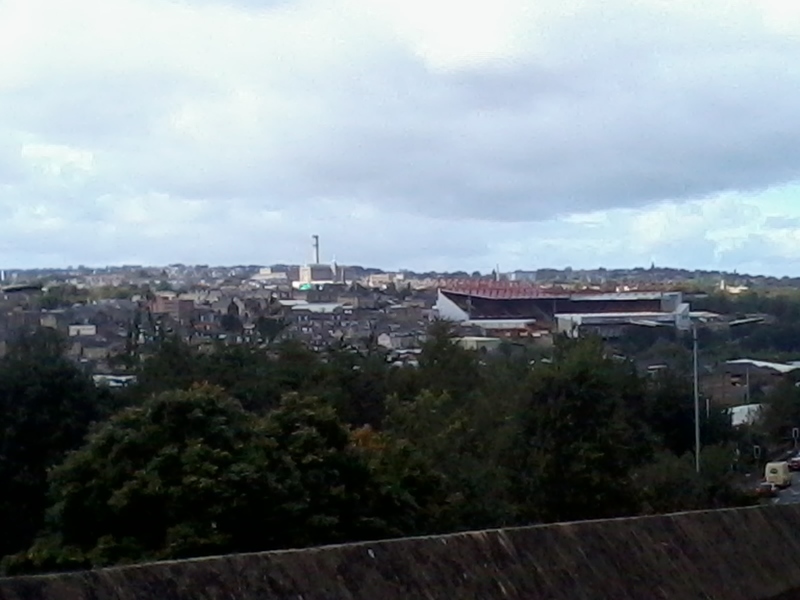 Valley Parade (I think it’s officially called Coral Windows stadium) from the opposite side of the City. It was their first Yorkshire Derby in over a decade. York City was just promoted to League 2, for the first time in years, from the Blue Square Conference Premier League and have been doing relatively well. Bradford City, sitting higher than York in the standings, is having a steady season and is surely hoping to get into playoff contention. It was a high-tempo game that both teams wanted to win. Both teams worked hard and played similar, straightforward football. In the end, they were both rewarded for their effort and the game ended in a 1-1 tie. It wasn’t the prettiest game to watch (aside from both the goals, which were both very good), both teams played very direct and neither team had long periods of possession; although I would say Bradford City had more of the ball overall. In this way, it was a very stereotypical “English” styled game. The ref didn’t help at all, stopping the game often and not allowing the teams to restart quickly from stoppages. 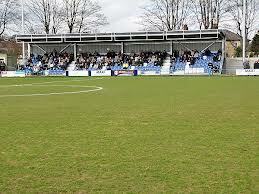 I would go as far as to say the Guiseley v Colwyn Bay game was more pleasing to watch. If you have read this far I’m impressed, I’m sure it has been a battle! This definition is relevant for me because in my battle to find a team and play soccer, I need to make sure I am not losing any ground! On top of that, I have to continue fighting to gain more and more ground. In anything you do, if you keep gaining ground, you will eventually win the battle and so the war. In summary, I’ve been to nice grounds, old grounds, historical grounds, big grounds, little grounds, natural grounds and man made grounds; I’ve been fighting to gain ground and finally, no matter how high you fly, its always best to have two feet firmly on the ground. Don’t be afraid to dive head first – even if its 730 mph like Felix! PS: I would also like to give an honorable mention to another type of ground: coffee grounds – always a top lad! Frank, did you know that Catherine was married at Bolton Abbey? It’s a beautiful church inside. Enjoyed that- a thoughtful piece of writing. Part tour guide of the English Countryside and part tour of the English Football Countryside. Very well done with the Felix angle too.